Q. Where is Haggard Hall 245? Where is HH 245? Where is the STC Mac lab? 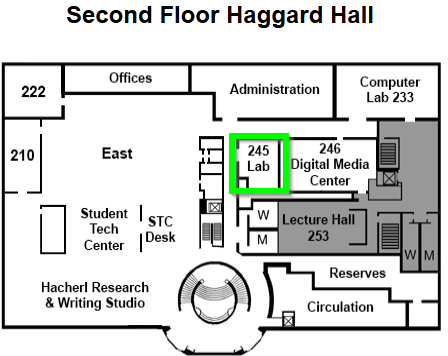 The Haggard Hall 245 Mac lab managed by the Student Technology Center is located on the second level of Haggard Hall, in the library. After entering the library heading south go past the rotunda into the hallway by the bathrooms and continue until you see it on your right. If you get to the Library Administration office you have gone too far.